We began our first Shabbat singing zmirot into the Jerusalem night and davening Kabbalat Shabbat at an overlook of the kotel. We coerced passersby within our reach into joining us. 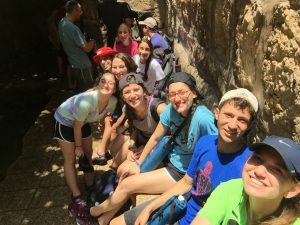 Afterwards, we went down to the kotel and the guys and the girls were each able to form huge dancing circles singing יבנה המקדש. The guys successfully vanquished all of the Jewish people’s enemies by singing “Am Yisrael Chai” with complete strangers. We then headed back to have a fabulous Shabbat dinner and an incredible tisch on the roof of our hostel overlooking Jerusalem. The next day, we had an incredible experience at three different minyanim, each with their own special feel. After a relaxing shabbos we went to a Classic Israeli rock concert and Noah H. took a selfie with the lead performer. On Sunday, after listening to the hysterical Neal “Ari” Lazarus rant about the Middle East and exercise we headed up North to Beit Shean and the guys failed to pass a frisbee while the girls chicken fought in the pool. Afterwards we went to the real Tzippori and learned where the name of Yavneh’s Tzippori came from. On Monday, Tuesday, and Wednesday we did multiple water hikes. Our dedicated security guard, Rahn, has already chosen his favorite camper: Jonah A. There truly are no words to describe Rahn’s bravery. On Wednesday night and Thursday, we learned about the lives of soldiers by visiting memorials and meeting Israeli soldiers at the Lebanon border. We heard an incredibly moving story from Hezi, the father of a fallen soldier where we all fell silent and many shed tears. Today, we came to Tzfat and had an interesting experience learning about the kaballah of this ancient city. We are now preparing for Shabbat and hope everyone back at Yavneh is having an amazing time with their second Shabbat.